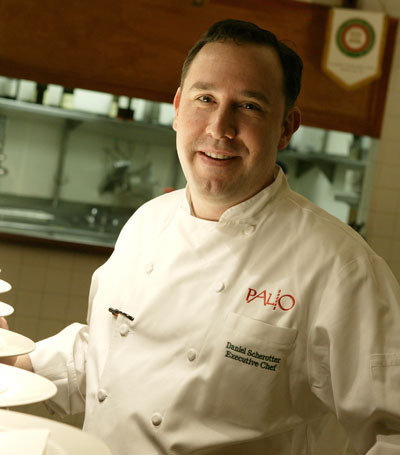 Daniel Scherotter, chef-owner of Palio d'Asti in the financial district, was serving the single best dish at the Golden Gate Restaurant Association's fundraiser last week: mini cupcakes from his new pastry chef. There were about four different flavors, including tiramisu, chocolate, lemon/ginger, none of which I am doing justice. Danny believes restaurants are going to need to outsource more and more non-core foods as costs rise due to the escalating minimum wage, mandated health care spending and the new sick leave ballot measure (9 days a year with very lenient notification requirement for employees, or so the GGRA says). This is why he hired his new pastry chef, Mimi Young of Scala's. The idea is to start selling pastries to as many other restaurants and caterers as possible. Danny sees it as the next logical step. Once you have Acme supplying your bread, Paul Bertolli selling you local gourmet sausages -- why make your own desserts?